In just two hours on June 15, 1944, three hundred amphibious tractors (LVT’s) carried over eight thousand heavily armed U.S. Marines onto Saipan Island in the Marianas Chain. It was a masterful display of amphibious warfare tactics and doctrine, but it also set the stage for a brutal, close range battle for control of Saipan’s sandy west coast. 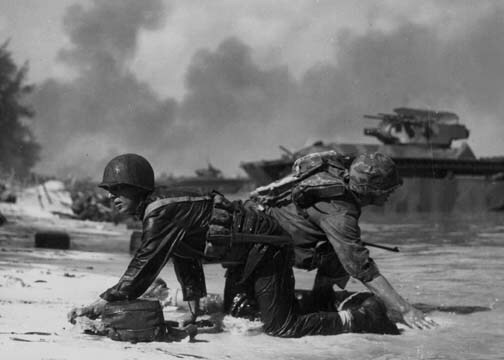 In places, the Marines found themselves pinned down by intense mortar, artillery and automatic weapons fire, and it took hours just to claw a foothold ashore. 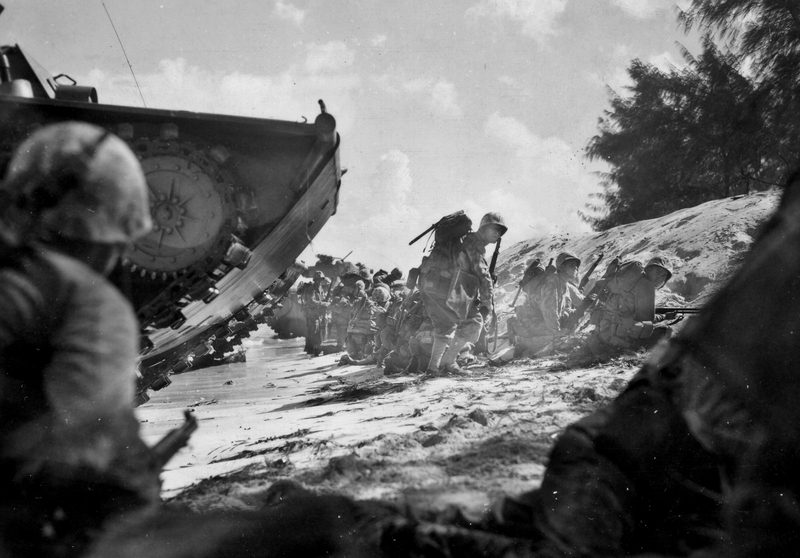 But by nightfall, the Marines had established themselves enough to repel the first of many Japanese counter-attacks. This short film clip is raw footage shot by one of the Marine combat cameramen who went ashore with one of the first waves. It is silent, as was most of the footage shot, but that only adds to the poignancy of these scenes. The images are striking, not only for the chaos and carnage they reveal, but also for the film’s clarity. Much of the Marine Corps color footage has deteriorated over the years so that they are predominately reddish or blue. It makes for muddy looking scenes, and in many cases the more common black & white film has stood up better over the years. This clip is stark, clear and the colors have survived the decades in remarkably good shape. Pacific Paratrooper has reached the H-Hour of the Saipan invasion and nothing tells the story better than this post and the short film included by John R. Bruning. As you well know, Sgt. Genaust, USMC, was one of the cameramen shooting footage on Saipan. He was later wounded and considered for the Navy Cross but was declined because he wasn’t a grunt. He later shot the only movie footage of the flag(s) on Iwo Jima only to be KIA a few days later in a cave.